Is it worth disapproving the BLM methane rule? A lot of questions are swirling around after news about what “significant steps” the BLM or DOI could legally take to reduce methane waste if Senators pass a Congressional Review Act resolution of disapproval to repeal the Obama administration’s methane rule. Looking at some of these questions only leads to more questions, and a lot of legal uncertainty that could prolong this fight for years to come — leaving the potential for unelected and unaccountable judges to make the final decision. The CRA is clear … agencies cannot promulgate rules in “substantially the same” area without an act of Congress. Has the definition of “substantially the same” been established in court? No. If BLM takes any regulatory action after the CRA the Agency will likely face prolonged litigation for carrying out their mandate to reduce waste of publicly-owned oil and gas. Can a revised approach based on the Notice to Lessees work? Probably not. Since 1979 BLM has used a system developed by USGS called Notice to Lessees and Operators of Onshore Federal and Indian Oil and Gas Leases, Royalty or Compensation for Oil and Gas Lost (NTL-4A). But since NTL-4A went into effect the technologies and practices for oil and gas production have advanced considerably. New techniques like hydraulic fracturing and horizontal drilling techniques have changed the game. Before the finalization of the new rule, no other federal rule covered all potential sources of lost gas. What about voluntary approaches? No guarantees. BLM or Interior can ask industry for voluntary action to address methane leaks but there is no guarantee that methane gas will stop being wasted and losses to taxpayers will be prevented. What could BLM or DOI do on the methane issue if the resolution of disapproval passes? It’s very unclear. Regardless of changes to the rule’s cost or technical components it’s not clear that BLM or DOI can re-engage the methane issue if the resolution passes. However, BLM can revise the regulation if no CRA vote is taken or if the CRA resolution of disapproval does not pass. Is there support for keeping the rule in place? Yes, especially by Republicans and Independents. 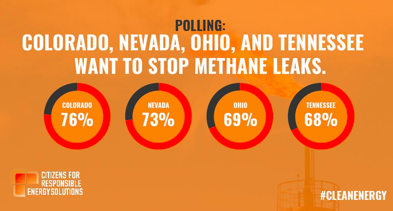 A March 2017 poll of voters in Colorado, Nevada, Ohio, and Tennessee showed overwhelming support for action to stop methane leaks. A majority of Republicans in these states support the Federal government taking steps to reduce emissions of gasses that cause global climate change (CO: 61%, NV: 63%. OH: 54%, TN: 56%). Support is strong among Independent voters too (CO: 74%, NV: 72%, OH: 71%, TN: 68%). More than four-out-of-five likely voters across each of the four states support requirements that all oil and gas producers who operate on national public lands use updated equipment and technology. Like voters in each state believe that natural gas leaks are harming the environment, with nearly three-in-four voters in Nevada and Colorado (72%) saying they believe it is harming the environment. Click here to read the polling memo and here for the survey toplines from WPA Intelligence, and click here to read an op-ed in Real Clear Energy by pollster Ashlee Rich Stephenson.